If you are a landlord, and your tenant fails to pay rent in Florida, you have the legal right to evict the tenant. The tenant has three days after receiving an eviction notice to either leave the property or pay the rent due. Learning more about the Florida eviction process can help ensure that tenants and landlords know their rights and responsibilities in this situation. Our Eviction Lawyers at HLF Real Estate Law are ready to help you. In most cases, rent is due on the first day of each month, which includes holidays and weekends, unless another date has been specified in the rental agreement or lease. There are some landlords who may agree that the rent is due the next business day if the due date falls on a holiday or weekend. If a tenant does not pay their rent on time, then the landlord has the option to serve the three-day notice for the failure to pay rent. The three day period the tenant has to vacate or pay begins the day the notice is delivered. Legal holidays and weekends are not included in this three-day period. The date that the notice is being served to the tenant. The ultimatum that the landlord has the option to pursue legal action if the tenant fails to move or rent. A statement that specifies how the notice was delivered to the tenant. The landlord can personally deliver the notice to the tenant. The landlord can mail the three-day notice through regular mail, certified mail, or registered mail. If the landlord cannot deliver the notice directly, they can leave it in a conspicuous space, such as taped to the front door of the unit. If the notice is not properly served, then the landlord must start over and ensure the process is followed. Tenants that pay the rent cannot be evicted, and if they fail to pay in the future, the landlord has to repeat the process. If no rent is paid, but the tenant moves out in three days, the landlord can use the security deposit to cover the unpaid rent. If this isn’t enough, the landlord has the option to sue the tenant for the remaining payment due. If the full rent is not paid and the tenant doesn’t move out, the landlord can file a summons and complaint to gain possession of the property in question. 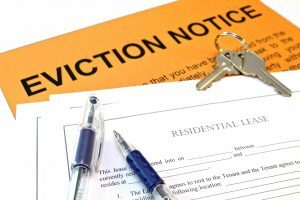 If a landlord or tenant needs help with the Florida Eviction Process, they should contact an experienced eviction attorney right away. We can help ensure you understand your rights. Call us now at 305-777-0474.